Rain Garden Oak Park - Contemporary - Landscape - Chicago - by Anne Roberts Gardens, Inc. Sustainable Rain Garden 3 years later. Holding water and no additional drainage needed. A simple, affordable solution to standing water and urban runoff. I'd also like to know the variety of grass planted here. The grass is Miscanthus sinensis 'Morning Light'. Grass - Can anyone tell me what kind of grass this is? What Is a Rain Garden? Rain gardens are planted areas that are designed to capture and slowly allow rainwater and stormwater runoff to infiltrate the landscape. They use natural processes to slow, filter and soak up stormwater, recharging the groundwater and contributing to the overall water quality of our communities. Annie Thornton added this to Stop Fighting the Patchy Lawn! 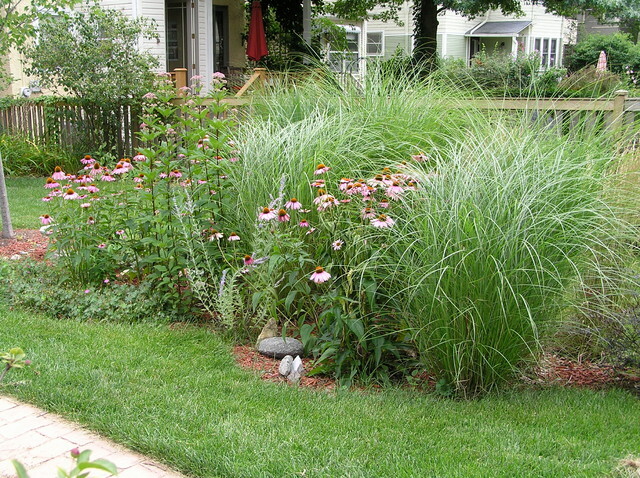 Annie Thornton added this to Houzz Call: Have You Installed a Rain Garden? They can replace lawn. This 3-year-old rain garden in Chicago drains urban runoff in an efficient and attractive way, replacing a patch of front lawn with water-tolerant coneflowers and ‘Morning Light’ miscanthus. Instead of draining to the street, water flows into this sunken perennial bed, where it’s cleaned as it percolates back down to the water table. Your turn: Show us your rain garden, if you’ve already installed one at your home. Upload your photos in the Comments. I love the grasses and the purple cornflowers. some beautiful grasses (not necessarily these) could be nice.